It was in 2005 that Eli Roth began with the production of his second feature film Hostel. Especially the viral marketing exceeds everything in the horror genre until today. 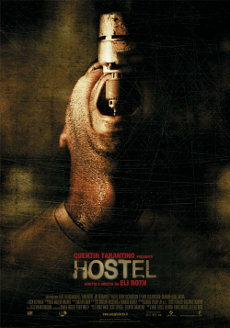 Every few days posters, pictures, trailers and clips were released, in order to show the horror fans that Hostel is the ultimate in terms of depiction of violence. Slight cuts to receive an R-rating did the rest. But that it wasn't so great after all became obvious through many negative reviews of the audience. Nevertheless, the movie clearly raised the bar regarding violence in the mainstream. Later, Sony Pictures released a minimally longer unrated version in the USA. In Germany Sony also released this version plus an additional version, rated according to the German film rating system of the FSK, which should represent the uncut theatrical version. But this isn't so clear. One scene, especially regarding the cuts for the R-rating, repeatedly comes up in the discussions, a scene which is contained in the FSK version: the suicide of Kana. Many websites state that all the bloody details of this scene were removed for the theatrical version. Besides IMDB, one of our users confirmed the missing of the scene. But in the end this couldn't be completely verified, so it could be guessed that the FSK version is a slightly less cut version based on the unrated. Further comparisons, among others with a version aired on the British TV on May 31, 2012, also showed the same differences as in the FSK version and they all contained the scene of Kana's suicide. This strengthens the thought that the R-rated version is identical to the FSK version and that the said scene was contained in the theatrical version. It's almost impossible that the British TV falls back on a cut German version. Compared was the R-rated theatrical version, which was aired on the British Channel 5 on May 31, 2012, with the uncensored unrated director's cut by Sony Pictures. The unrated version runs 8.7 sec. longer than the R-rated version. There are differences within 3 scenes. Another bloody close-up of the sawn through leg. The shot in which pus is coming out of Kana's eye is longer. She screams in pain. Kana screams longer. Paxton tries to calm her.